I guess most of you would like to choose iPad over desktop computer to watch movies and TV shows if possible due to the advantages that iPad has nowadays. An iPad is light to carry so you can download various types of movies and TV shows on your iPad to take it with you whenever you want to watch and wherever you are. You can also use it to shoot videos on different occasions such as at a party, conference or a concert. But you may delete some of your favorite movies or videos by tapping the wrong button carelessly. If you encounter this tragic situation, what can be done to make up for it? This is when MobiKin iPad Video Extractor (Windows/Mac) comes in handy. It is a third party tool to extract the deleted iPad videos to save them on a computer or Mac. Apart from the videos, this iPad data extractor allows other iPad files like contacts, messages, photos and more to be restored from your iPad to the computer completely. And it has two recovery modes for you to choose from. Later we will introduce the steps to perform the software to you. And you can download a free trial version to try first. Both Windows version and Mac version are available. Here we go. Easy Steps to Extract Deleted Videos from iPad Device. Here is the recovery software to help you extract the deleted iPad videos to computer directly in 3 steps. First connect the iPad to your computer and launch the software. Then you can choose the default mode "Recover from iOS Device". If you haven't jailbreaked your iPad, you need to follow the steps shown on the window to jailbreak your iPad first, otherwise the program won't detect your iPad. After the jailbreak, you can hit "StarScan" to let the program scan your iPad. After the scanning, the specific information of your iPad will be displayed on the interface of a popped-up window beside. 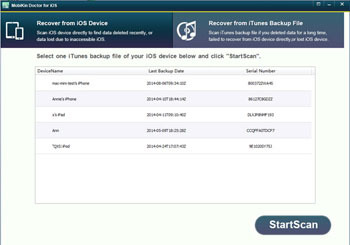 The basic parameter such as the iOS version and iTunes version are listed on right panel and the files on the left. Preview the files carefully. To recover the deleted videos, you need to click the "Videos" on the left sidebar and go through the items on the right part of the interface. Tick the lost iPad videos and click "Recover" to extract and save them on your computer. 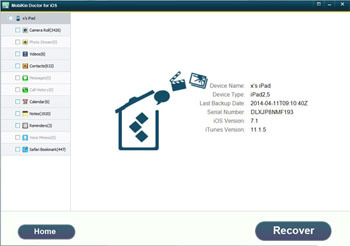 Solution to Retrieve Deleted Videos from iPad Backup File. In this mode, you don't have to connect your iPad to the computer which is time-saving. 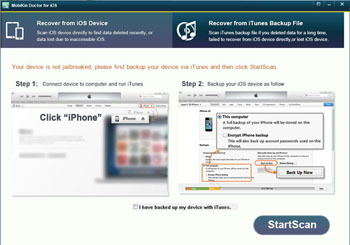 Since you have backup in iTunes, you can just run the program and choose "Recover from iTunes Backup File" mode. Then select the iPad backup file and start the recovery. The next procedures are exactly the same with the default mode as we stated above. Tip: Besides the videos, the program allows you to extract other media files such as photos, music and more. Come and download a free trial version to have a try first. It's definitely a good assistant to recover the deleted iPad data.